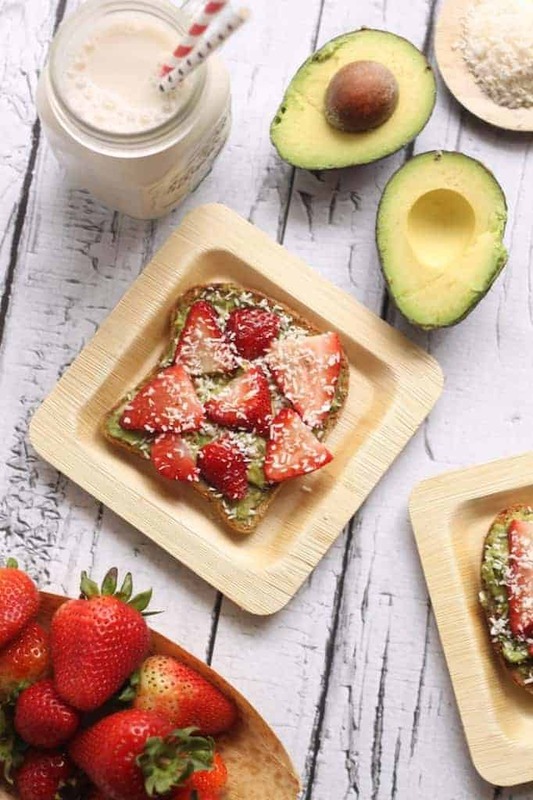 The Yummiest Strawberry Avocado Toast for Breakfast! 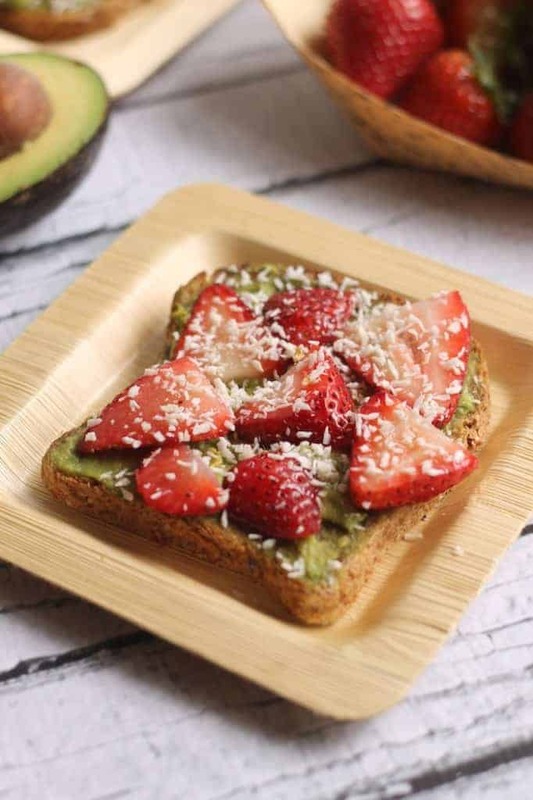 The best ever Strawberry Avocado Toast with creamy avocado, fresh strawberries, coconut, and honey for the perfect sweet and savory healthy breakfast. I like my sweet and I like my savory but I LOVE when sweet and savory fall in love and make fantastical sweet salty babies. Like chocolate covered potato chips. And watermelon with feta. And salted almond dark chocolate. And bacon wrapped dates stuffed with goat cheese minus the bacon perhaps. Like dis tooooast. Avocado toast on steroids! ‘Tis the year of the toast. Avocado toast. Everyone’s doing it. It’s the coolest thing since sliced bread. It is sliced bread. This recipe is so easy that I almost felt stupid posting it. But because it’s the most epic of epic and simple of simple flavor combos, I felt most thoroughly obliged to take pretty pictures of it and tell you exactly what’s in it (as if you couldn’t make it on your own by simply looking at the one I instagrammed just the other day). If I didn’t instagram the toast, did it actually happen? Let’s talk about how complex this recipe that actually isn’t a recipe is. Toast bread. Mash avo. Slice strawbs. Top with coconut and a drizzle of maple. EAT. Eat again. Eat for all the meals. In all honesty, I really didn’t think avocado toast could get any better. Then I topped it with strawbs and served it on a teensy bamboo plate and like WOAH. This is next level stuff. Go ahead and elevate your toast. Go ahead and drink your almond milk out of a black and gold polka dot straw. Score avocado with a knife and add to bread, lightly mashing. Top with sliced strawberries, a sprinkle of coconut, and a drizzle of maple syrup. Add a pinch of salt to make it really pop! For a gluten-free version, simply use gluten-free bread. Absolutely gorgeous shots, Alexis…has summer written AWLLL over it!! Need to try this combo asap- party in my mouth….YES PLEASE! I can’t believe those plates as disposable! They’re so much classier than paper plates ;) This toast looks DELISH!! I’m pretty obsessed with avocado toast with tomato and hard boiled egg…so maybe I could have this for dessert? All the toast! 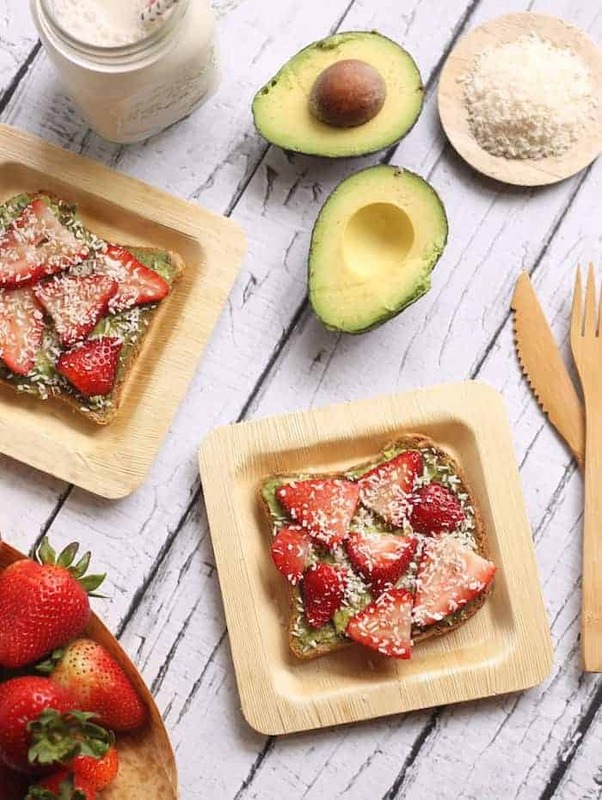 Guac and strawbs on my toasty toast?! I want a whole loaf’s worth! I’m right there with you on the salty-sweet subject. I want this on all the days! Looks amazing-balls and I definitely need to try this, because I would have NEVER thought that this combo could work…but then again if you’ve got bread, in my eyes, everything will work! Happy Monday friend! Mmm perfect toast! Whenever I use bread, I toast it….toast it a lot so it’s burnt! Haha, I love it that way! Yum, yum, yum! Sweet and savory is the BEST!! Who knew toast could look so pretty?! This looks delicious! It is so perfectly summery and beautiful, Alexis!! Crunchy & creamy & sweet & salty… mmm, this will be the first thing I’m gonna make when I get to the U.S. on Thursday!!! 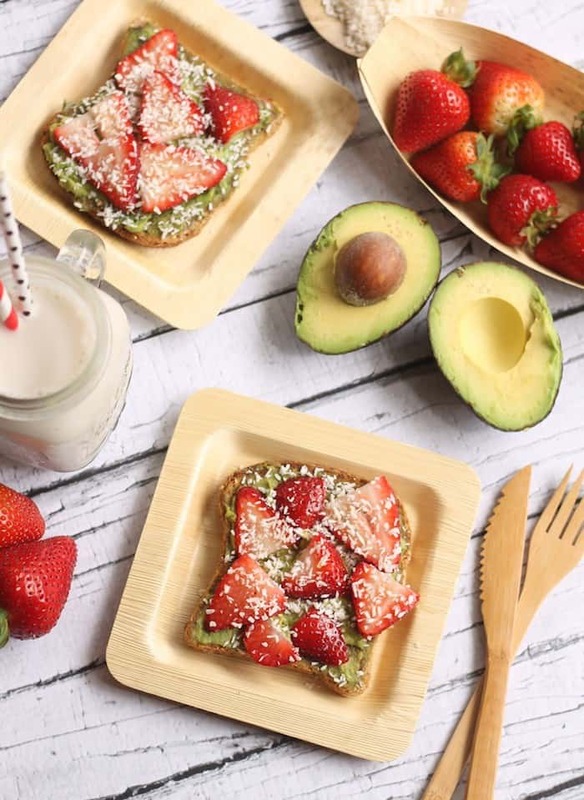 Oh my gosh I love avocado toast and never thought to throw some strawberries on there. What a great (yummy) idea! This looks like a perfect combo! Why haven’t I tried strawberries and avocado together!!!! My sister didn’t know what avocado toast was when I mentioned it to her the other week. I wanted to be like, do you go on the internet haha?!? Seriously love those bamboo utensils. Lol- minus the bacon perhaps! I was wondering about that one! I’m a huge fan of the sweet and salty combo too so this is right up my alley! I can’t wait to give it a try!